Hairdresser Basins. Salon Backwash. Hairdressing. Shires. 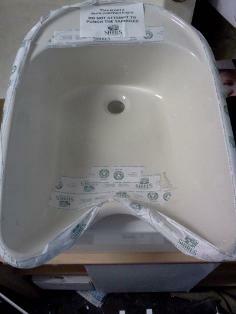 Back Wash Basins For Hairdressers and Barbers Salon. Recessed Front For Neck And Head Recline Rinse. British Made By Shires Bathrooms. Hairdresser Sink For Salon. JSL Bathrooms. 17-19 Carter Street. Bradford. Low Trade Prices On Quality Products Since 1978. Shires. British Made. Backwash Basin. Ceramic. Ideal for Hairdressers Salon. Measures Approx. 600mm x 450mm. THIS IS THE LARGER SHIRES MODEL. Salon Basins. Backwash. Hairdressing Basin. Large Size. Cheap Low Prices. Bradford. Yorkshire. JSL Bathrooms. British Made Quality By Shires Bathrooms. Shires. British Made. Backwash Basin. Ceramic. Ideal for Hairdressers Salon. Measures Approx. 600mm x 450mm. Indian Ivory Off White Colour.